One of the older games I like to still play now and then over 20 years later: Imperialism. This game, as the name might imply, simulates being in charge of an expanding early industrial nation in the 19th century (either a random "fantasy" world or a historic Europe scenario). 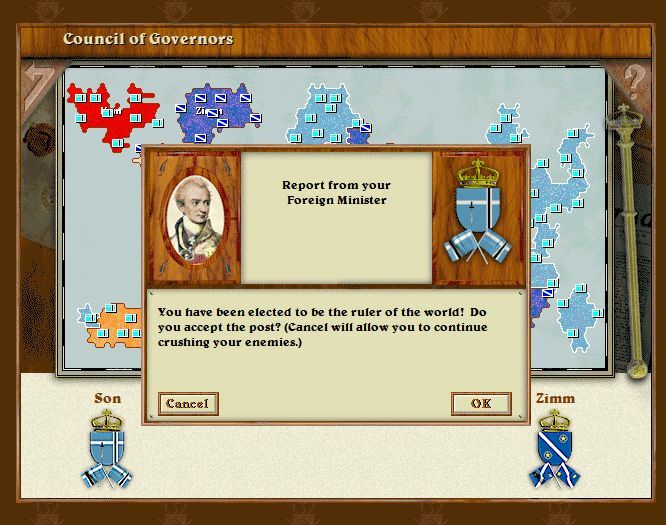 Luckily, it does not try to simulate every little thing that could be done, but focuses on a few mechanics that reflect the times politics quite well I think: Production and recruitment only happen in your capital, where you expand factories, build ships, railroad cars and such. It is your first task to connect your countryside to your capital via ship or train, which purpose is basically to just supply resources to your centralised state: Food, wood, iron, coal and a few more, with the later addition of oil. Money for your budget comes, aside from gold or gem mines, only from trading, which requires even more resources to produce export goods like textiles, weapons, tools or furniture. To further this, you can make smaller countries your colonies, leading to them selling cheap raw materials to you and buying your processed goods. It might be simplified, but to me, it shows how centralisation, resource exploitation and colonialism work very well. As an adolescent, I also learned quite a few things about history from the games tech progress. Going till 1915, you can develop early modern arms, leading to an approximation of WW1's meat grinder if you try to charge into 30 fortified artillery units. You may either win by conquest (try before the aforementioned situation occurs) or by being elected world leader (also happening if you conquer enough clay). In my experience, the higher difficulties are brutal, but the funny random country and province names as well as the quarterly newspaper let you fail in enjoyment. On easy difficulties, it is nice relaxing game caring about cotton, wool and wood shipments. Just a few more guns than Settlers of Catan. Added benefit: It runs on any kind of wimpy Notebook if needed and is available on gog.com. There is actually a second part, set in the age of colonialism, but I never warmed up to it.